(Nanowerk News) Researchers at the UT-research institute MESA+ have developed a method to improve the resolution of a conventional wide-field optical microscope. Scattered light usually reduces the resolution of conventional optical microscopes. The UT-researchers however found a simple and efficient way to actively use scattered light to improve the resolution of images. It is like the fog has cleared, according to the first author Hasan Yilmaz. The paper is published in The Optical Society’s (OSA) new high-impact journal Optica. The smallest detail a traditional optical microscope can reveal is about half the wavelength of green light, or 0.25 micrometer (a micrometer is a thousandth of a millimeter). Many interesting and important structures in biological cells and computer chips have features smaller than that. A very convenient and general method to enhance the resolution of microscopes is to structure the illumination. From several pictures under different illuminations, a single high-resolution image is constructed in the computer. So far, scientists have carefully selected the clearest glass optics for such imaging. Yet, the range of materials from which clear optics can be made is limited. In many materials random scattering takes place. Randomly scattered laser light appears as a finely grained speckle pattern as a result of interference of many scattered light paths. Researchers at the MESA+ Institute of the University of Twente in the Netherlands have developed a new and powerful approach to use these fine speckles for high resolution imaging. Using optimized scattering materials they produce the finest-grained speckles yet made with visible light. With this speckle illumination they obtain fluorescence images that have a very high resolution (0.12 micrometer) and a wide field of view. In the new method, the object you want to see – for instance a biological cell – is placed on the substrate of the scattering material and the laser light is shone upon the scattering surface. The lens creates a speckle pattern that can be scanned on the object. Multiple low resolution images of the object are then combined in the computer, which leads to a clear image. “The resolution improvement looks like the fog has cleared” says Hasan Yilmaz, the paper’s first author. “But in fact it is the low resolution image that is taken with clear optics. The high resolution picture is taken using scattered light!” The speckle illumination method is surface-specific and robust to environmental noise. 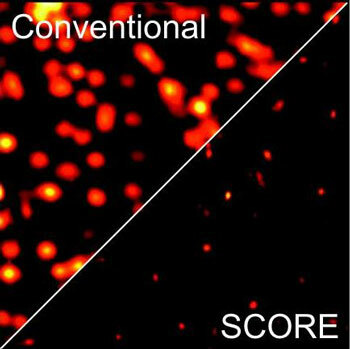 The new high-resolution imaging method, called Speckle Correlation Resolution Enhancement (SCORE) is reported in the Optical Society’s (OSA) new high-impact journal Optica ("Speckle correlation resolution enhancement of wide-field fluorescence imaging").